I had never heard of this band until today. (Have I been living under a rock? Just overseas) It looked interesting, so I clicked on a song. Christian? LDS? I don't know but does it matter? The message is awesome, something I'd like to hear often in my home. I clicked to the next song, 'Nothing is Impossible'. This is something I'd like to hear often, like the tune, "What Would I do Today, if I Were Brave?". Songs like this lift, fire our imagination, creativity and Spirit. I have never listened to this group's former albums so have nothing to compare it with. After reading comments, I WANT to listen to all their albums, but this one works for me. We have been fans of Nashville Tribute for a long time and this new release didn't disappoint. They are such a talented group and know how to change things up a big (Who We Are) and bring up new points of view to ponder. For example in The Fall, the phrase "we couldn't do it all" strengthened my testimony of the whole purpose of the Fall. Also the refrain "Nothing is impossible" often runs through my mind at just the right time, which tells me that the Spirit is able to communicate to me through The Word and The Nashville Tribute to the Bible. So glad they recorded this CD. I have all this band's other albums. I bought this one along with Redeemer. It took me a couple of listens to really get into the style of this album. Still, we listen to it regularly and have come to love the messages of the songs on this album just as much as we love their other albums. Can't wait to see what they come out with next! I absolutely love this CD. I have had it in my car since the day and got it and listen to it going to work and coming home! I've used the songs to look up the corresponding Bible stories to help aide in my scripture study. I also have their Christmas CD which I adore! Going to ask my kids to get me their other CD's for Christmas! Our family is a huge fan of the Nashville Tribute Band. We have all of their albums and have driven from California to attend their concerts in Utah and Idaho. When their first album, Joseph, came out, I drove ten hours to present the album to my family and listened to each song with them as we cried and our testimonies grew. I, along with everyone else, was impatiently waiting for this latest album. We were so excited and we wanted to love it, but it is with a hesitant heart that I say that we are disappointed in The Word. It sounds like Christian radio - generic, undistinguished, and most of the songs are empty. Out of the fourteen songs on the album, only five come anywhere close to the quality song-writing of The Nashville Tribute Band (The Fall, That River Gonna Rise, Still Small Voice, Jericho, and Staring Into the Flame). All bands eventually move away from their beginnings, trying to evolve and become more cutting edge. But in that process, they lose the very sound and feel that made them successful in the first place. I fear that this is what's happening to the Nashville Tribute Band. The reason why the band skyrocketed to fame was because they were different. They were not contemporary - they were clearly country. Their song-writing was superior, and their songs and albums were focused on LDS themes: Joseph Smith, the Restoration, the pioneers, and missionary work. The Redeemer album began moving away from the traditional sound of the Nashville Tribute Band, but because of the excellent song-writing, it was still a great album. The Word has moved even farther away from their original sound and feel. The majority of the songs on this new album not only sound like just another Christian band that you would hear anywhere, but there's also a noticeable difference in the quality of the song-writing - it's not as good as the previous albums. 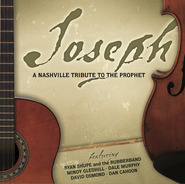 I hope that the Nashville Tribute Band remembers their LDS audience and what made them popular in the first place. I hope this album is just a glitch and not the beginning of the end. We love the Nashville Tribute Band and the inspired songs they have brought us in the past.